﻿ Levante 1-3 Real Madrid. Reacquiring the winning habit! 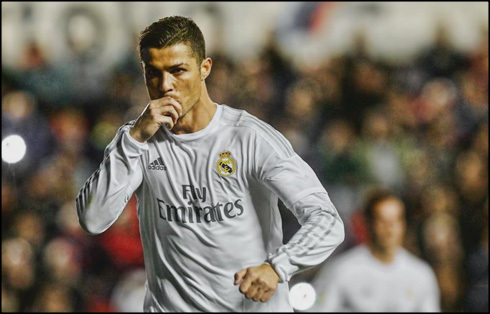 02.03.2016 » Levante 1-3 Real Madrid. Reacquiring the winning habit! 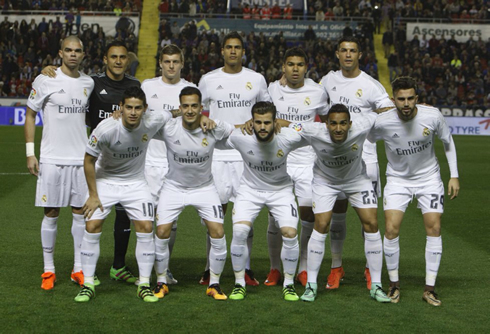 Zinedine Zidane decided to give a chance to a few of the team's canteranos and despite the difficulties, it paid out. Real Madrid have beaten Levante 1-3, in a game where it was Cristiano Ronaldo scoring the opener and once again from the penalty spot. It was a quite uncommon Real Madrid side that stepped on to the Ciudad de Valencia stadium to face Levante this Wednesday night. Zinedine Zidane picked up the likes of Borja Mayoral and Lucas Vázquez by benching a few more established players like Isco and Jesé Rodríguez. At the end however, it turned out his gamble worked out as he intended. Real Madrid brought home the 3 points in a 1-3 win against Levante, in an another overall poor display from the Merengues. Cristiano Ronaldo scored his 23rd league goal after converting his 8th penalty-kick this season and assisted Isco for the goal that sealed this game, already late in the second half. With La Liga surely out of reach, Madrid secured a 3-1 victory away to Levante, their first in three matchdays. It was clear from the demeanor of the players (as well as Zidane's squad selection), that Madrid were clearly in the experimental stage, already looking ahead to the future. The likes of Casemiro, Borja Mayoral, Lucas Vazquez and Nacho all started for the Merengues. Still, many of the problems still existed: lackluster finishing and a lack of imagination up top the main culprits. Who could imagine a year ago that the absence of Gareth Bale would have such a profound impact on the attacking ability of the team. Most of the eventual action would take place before the break, with a flurry of goals in a six-minute span. Lucas Vaquez was taken down in the box in the 33rd and Cristiano Ronaldo promptly put away the resulting penalty. A few minutes later and Borja would make his mark. A brilliant spinning and shot at the edge of the box ricocheted off the post before trickling in off the goalkeeper. A bit unlucky for everyone involved as the keeper could only clumsily hit the ball into his own net, and Borja himself was unable to net his first goal for the senior team. 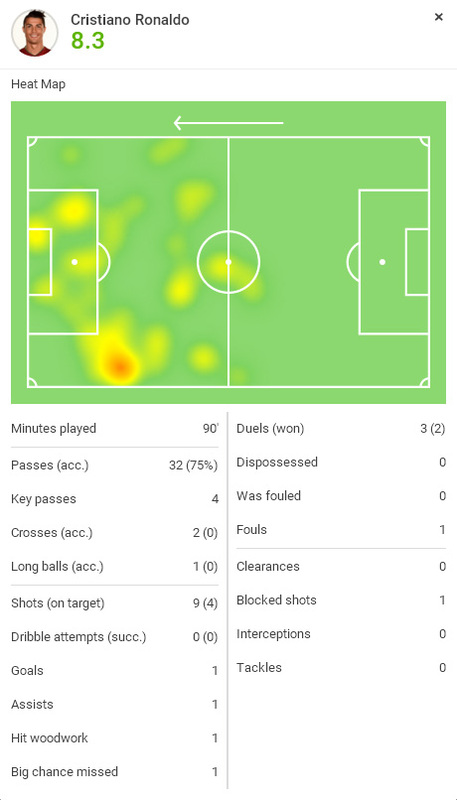 After the break, Levante would keep up the pressure looking nothing like a bottom feeder in La Liga. But despite their valiant attempt, they were unable to mount the comeback needed to defeat Zidane's team. In the end, Madrid would add another late goal. 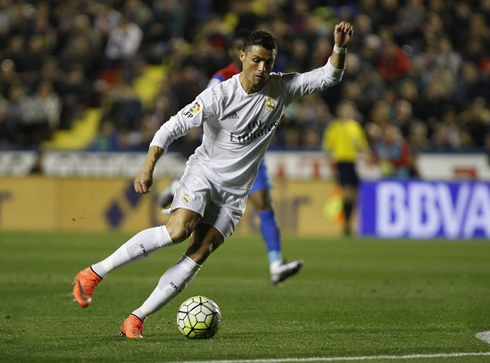 Substitute Isco put a tidy finish past the keeper, after a nice assist from Ronaldo in the box. 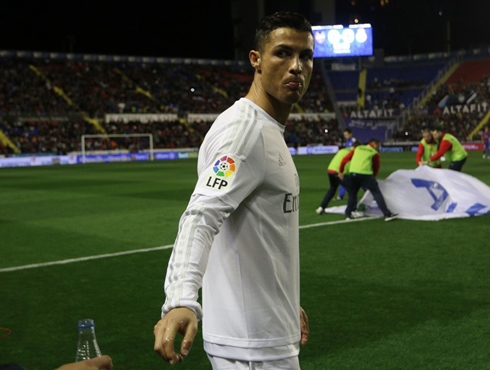 Cristiano Ronaldo next game with Real Madrid for La Liga is on the 5th of March of 2016, against Celta Vigo. You can watch Juventus live stream, the Real Madrid vs Celta Vigo, Rayo Vallecano vs Barcelona, Manchester City vs Aston Villa, Tottenham vs Arsenal, and Borussia Dortmund vs Bayern Munchen, all matches provided from our football live game pages.